We have some really beautiful boys at Tobysden. We select our boys on the basis of temperament and health as well as good looks. Yogi is our first home-bred stud and Sultan is our 5 year old boy from Scotland who has already had some fabulous kittens. Yogis father Harley is now retired - at the age of 8 I thought he deserved it! All our boys are tested at least annually for HCM and were negative in 2015. Yogi has retested normal in March 2016. Sultan is not due for retest until September 2016. They behave perfectly for this procedure for which they have to lie perfectly still on their sides for at least 20 minutes all wired up to the ECG machine with all 4 paws. Neither of them needed any sedation which says it all about their temperaments. 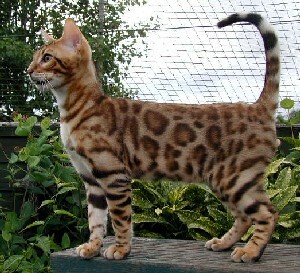 All our breeding cats are also tested for Bengal PRA and PKDef. Yogi is normal for both Bengal PRA and PKDef. Sultan is normal for PKDef and a carrier of Bengal PRA. This is a recessive gene and he can safely be mated with our girls who have tested normal. Carriers of this gene have normal sight. Sultan will not be mated to any queen who carries the BPRA gene.